There are two primary payroll taxes in the United States: the Social Security payroll tax (at a rate of 12.4 percent) and the Medicare payroll tax (at a rate of 2.9 percent). While the Medicare payroll tax applies to all labor earnings, the Social Security payroll tax applies only to an individual’s first $132,900 of wages and self-employment income. This cap on the Social Security payroll tax is indexed to wage inflation. 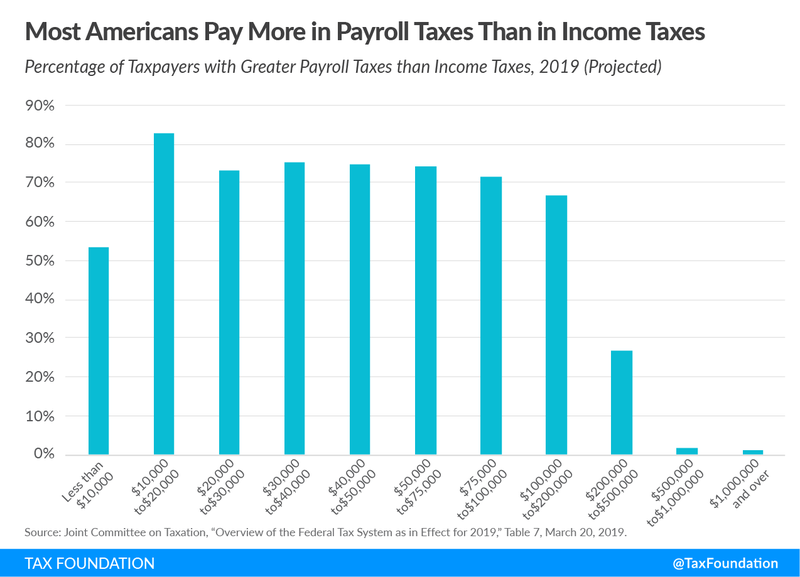 The following chart, based on data from the JCT report, shows the percentage of taxpayers projected to pay more in payroll taxes than in income taxes in 2019. The majority of taxpayers in every income group up to taxpayers earning up to $200,000 annually will face a greater burden from payroll taxes than from income taxes. In total, 67.8 percent of taxpayers will pay mostly payroll taxes. One possible reason for the relatively heavy payroll tax burden is the Tax Cuts and Jobs Act, which lowered taxes for most individuals. Because income taxes are now lower for most low- and middle-income Americans, payroll taxes have risen relative to income taxes as a share of the overall tax burden. Payroll and income tax rates also differ in how their average rates change with income. 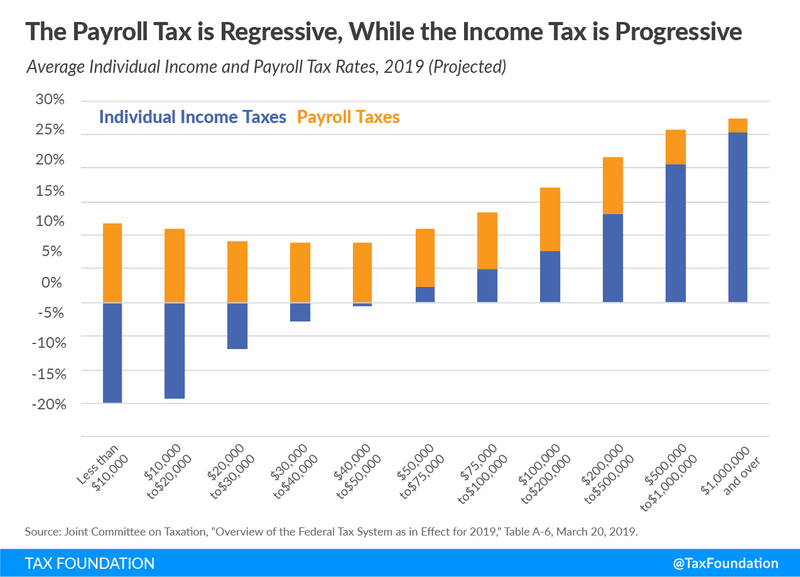 The following chart shows the JCT’s 2019 projections of the average income and payroll tax rates. The payroll tax is regressive, with the highest average rate falling on Americans with the lowest incomes. For example, for people making between $30,000 and $40,000, the average payroll tax rate is projected to be 8.8 percent, while for those making between $500,000 and $1 million, the average rate is projected to be 5 percent. This is in part due to the impact of the cap on taxable wages. In contrast, the income tax is progressive, with the average rate rising with income. For example, those making between $30,000 and $40,000 will pay an average income tax rate of -2.9 percent, while those making between $500,000 and $1 million will pay an average rate of 20.7 percent. As the JCT report makes clear, policymakers and the public would do well to keep in mind the importance and regressivity of payroll taxes.